Three New Zealand servicemen were sent officially to Mount Athos, a peninsular in the northern part of Greece, to present citations to various Monasteries which, in spite of seriously risking their own lives and safety, had been instrumental in caring for New Zealanders and other allied troops, during the Second World War. Two years ago, during a search for the origin of these certificates -signed by the then Prime Minister of New Zealand, Peter Fraser, and Gen Bernard Freyberg, Commande of the 2nd NZ Expeditionary Force- a hitherto unplayed recorded talk was luckily discovered in the archives of Radio New Zealand. This talk, was made by one of the visiting group, Peter McIntyre, the renown Official War Artist, and had been recorded on New Years Day, 1945. A collection of 83 photographs, taken by the team on this visit, was discovered, also recently, in the National Library of New Zealand. The talk and photographs that came to light, provide a rare and extraordinary insight into both Mount Athos, and the kindness and generosity of its inhabitants. 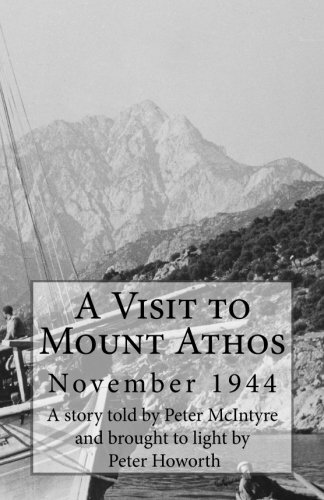 We are particularly pleased that the tireless philathonite and friend, Peter Howorth, relative of the New Zealand living legend who was rescued adventurously in M. Athos, “Sandy” Thomas, (95 today), brought to light that historic journey and has entrusted Athos Press to care, revive and publish it. By making this booklet available to the public, seventy years later, that remarkable 1944 New Zealand visit toMount Athos finally regained its own multidimensional and historical significance. Enjoy this rare piece of Athonite and post-WWII history! Get it on Kindle edition!